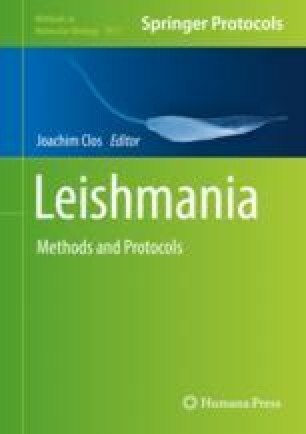 High content analysis enables automated, robust, and unbiased evaluation of in vitro Leishmania infection. Here, we describe a protocol based on the infection of THP-1 macrophages with Leishmania promastigotes and the quantification of parasite load by high content analysis. The technique is capable of detecting and quantifying intracellular amastigotes, providing a multiparametric readout of the total number of cells, ratio of infected cells, total number of parasites, and number of parasites per infected cells. The technique can be used to quantitate infection of any Leishmania species in virtually all types of permissive host cells and can be applied to quantification of drug activity and studies of the Leishmania intracellular life cycle stage. We would like to thank Lucio Freitas-Junior for technical discussions. This work was supported by the European Union’s Seventh Framework Programme under grant agreement no. 603240 (New Medicines for Trypanosomatidic Infections—NMTrypI), and the Drugs for Neglected Diseases Initiative. For this project, DNDi received financial support from the following donors: Department for International Development (DFID), UK; Directorate-General for International Cooperation (DGIS), The Netherlands; and Swiss Agency for Development and Cooperation (SDC), Switzerland. The donors had no role in study design, data collection and analysis, decision to publish, or preparation of the manuscript.